Have you ever found an author so likeable in person that you want to read their books, only to find that you are completely confused at the end? That is my current dilemma with Susan Dennard’s novel, Truthwitch. I saw Susan Dennard at an event where she was on tour promoting her latest novel in the series, Windwitch, and liked her personality so much that I figured I would give her books a shot. I will say this, while I liked Susan Dennard, I am not sure how I feel about this book. I like it and at the same time I have so many questions! Dennard’s writing is wonderful, her characters are enigmatic and fun, the world building was sort of there and it is fast paced from the first page. However, there are some gaping holes not only in the plot of this story but the character development and world building as well. There is the obvious girl power concept – I love the idea of two friends that are so close they would do anything for each other. It’s great premise that I think we should see more of as I often find that female characters are competing with one another instead of playing supportive roles to each other in these types of books. Safi and Iseult are witches with different abilities – Safi is a truthwitch who can tell the difference between a truth and a lie, Iseult is a threadwitch, meaning that she can sense the emotions of others and the world around her. Their magical abilities and steadfast friendship makes them a unique pair. They are as close as can be, but I would have liked their friendship and their background to have been built up a lot more. I know they would do anything for each other, but I do not have any background information as to why that is. We get a glimpse into each girl’s past, but nothing elaborate or meaningful to the reader. The world building – it is sort of there. However, I do not understand the political dynamics between the different lands in the Witchlands. I know that there is a war coming – there are politics at play, but once again, this part of the story falls short for me because there is little to no background or character building. Safi’s uncle is part of a larger plan to keep peace between the lands (not sure what to call them) or was he trying to start another war? I am not sure. It becomes a little hazy to me. I am also confused about all of the abilities that the characters have – aside from Safi and Merik’s abilities, which are straightforward. Iseult’s ability is more interesting and I would have loved so much more depth and insight to her ability. The concept of the threads was confusing and lacking explanation. What are the threads? Why does everyone have threads? I do not know. Someone smarter than me, please explain. There is nonstop action – but a lot of it seems to be filler action to keep the story moving and plays no particular role in the story other than as a vehicle to get from one scene to another – because once again the story is lacking background and history. Romance – for those readers who are looking forward to the romantic elements in this book, be wary, it is there but barely. While insinuated, I felt the romance between the two characters was predictable and shallow. The exchanges between the two characters are lacking depth – why do they all of a sudden love each other? I get it – the people want kissing! But, I want relationships to be natural and interesting – Merik and Safi are neither. Iseult and Aduan, however, could be the real stars of the show – so I am hoping that in the next few books we get a dynamic and complex relationship between them. While reading this book my mind was prone to wander and I wonder if that is because the author bit off so much that it all felt jumbled and disjointed and never really came together into the cohesive story that I wanted to read. 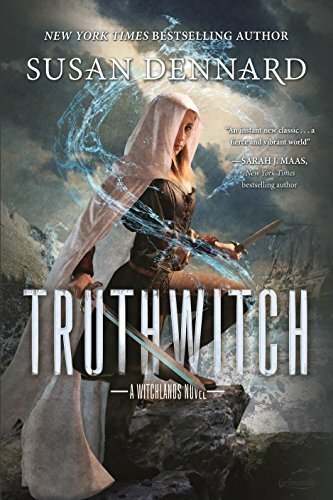 As of this review, I have not yet read Windwitch so I am unsure of whether the story gets clearer with a definitive point and purpose or if it is just more of the same swashbuckling action with no real destination. I know that this review seems negative – I do not think this is a bad book at all – just lacking direction and details. Dennard is completely capable of building a world that we want to inhabit – I just felt that there was not enough in this first attempt. I hope that Windwitch can offer what Truthwitch lacked.